Place bread slices on sheet tray and broil until lightly brown, 2-3 minutes. Rub warm bread slices with garlic and set aside. Discard any leftover garlic. Fill a large sauce pan with water and bring to a boil. Add peas and blanch until just tender, about 1-2 minutes. Meanwhile, fill a large bowl with ice water. Immediately place peas to the ice water to cool for 5 minutes. Drain peas and transfer to a food processor. Add mint, salt, pepper and olive oil and puree until desired consistency is reached. Alternatively, mash with a fork or potato masher. In a bowl, combine ricotta cheese, lemon zest and juice. 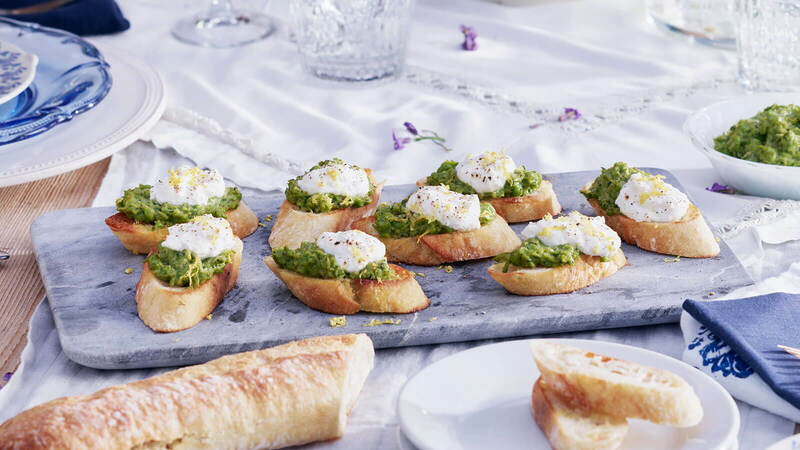 To serve, spread a spoonful of pea puree over bread slices. Top with a generous dollop of the lemon ricotta, a few grinds of fresh pepper and a drizzle of olive oil.